New attacks! New dangers! 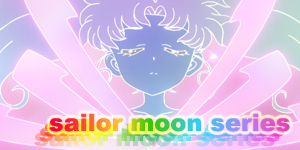 And the five Sailor Soldiers finally gather! 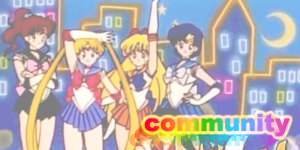 Cover: Following the theme established by the previous disks, this cover features Sailor Venus in prime position on the front cover surrounded by Sailor Moon, Sailor Mercury, Sailor Jupiter and Sailor Mars. 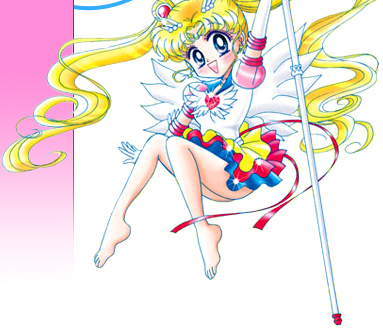 The back cover shows Sailor Venus striking an attack pose in the centre of the four episode descriptions. Very well designed. The Menus: Those who have seen the previous disks in the series will know what to expect here. 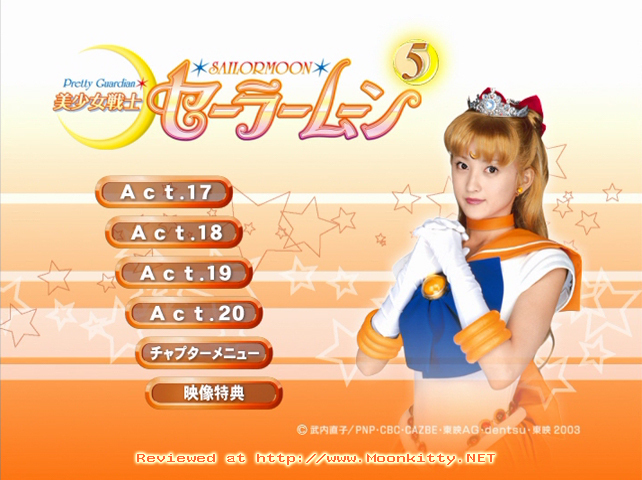 This time around we have Sailor Venus (with Moon Princess tiara!) on a nice orange and gold ribbon and star layout. 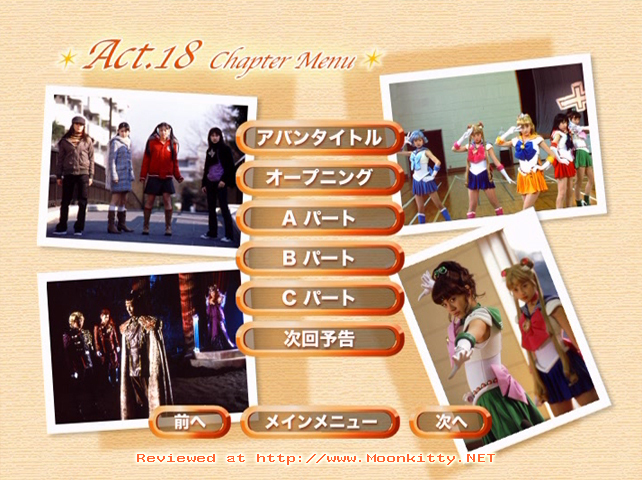 The Chapter Select screens once more show some great promotional photos from the four episodes on the disk. 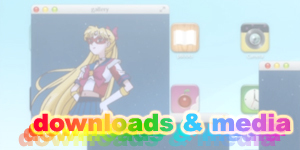 Everything loads very quickly and is easy to navigate despite a lot of the buttons being in Kanji. 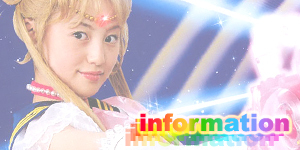 The Special Features: Featuring the latest in the ten minute behind the scenes documentaries, Miyu Sawai (Sailor Moon) is finally joined this time around by Myu Azama (Sailor Jupiter). They talk about their first impressions of each other and how much they've changed since the season started. The highlight though is some much wanted bloopers of the girls slipping and sliding all over the church auditorium set. 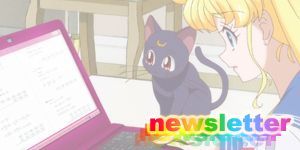 There are also some cool deleted scenes with the best one being a cut scene featuring Makoto spying on Usagi and Mamoru accompanied by a group of children who enjoying the chemistry between the two as Makoto keeps them up to date. The Episodes: This disk features a great selection of episodes with the first two by far being thr strongest. 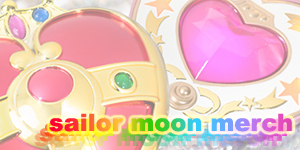 Act 17 and Act 18 finally gives the Moonies what we want with Sailor Venus finally joining all the Sailor Soldiers in a battle (this is the first time Sailor Jupiter has seen her), Sailor Mars picking up her training, a new special attack from Sailor Venus as well as some much needed emotional depth for both. We're also treated to Sailor Venus' much delayed transformation which easily knocks the other girls' transformations out of the water. 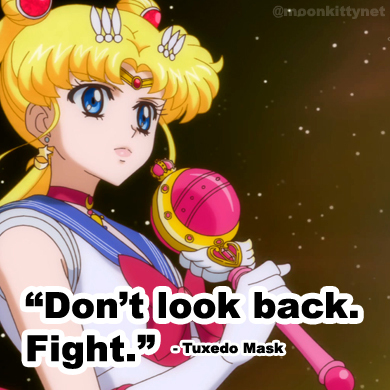 Act 19 and Act 20 are also great views as they both focus on Mamoru and Usagi's developing relationship and how both of them deal with the new character, Hina who was thrown into the mix at the end of the last DVD. The characterisation is very well done for both of the characters and while I found the chemistry a bit forced in earlier episodes, after watching these two episodes you just know these two are meant for each other. 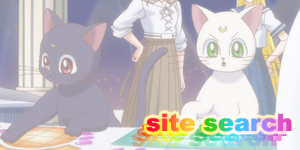 The only negative I could really think of was the addition of the character, Hikari who serves as a little 10 (or so) year old romantic advisor for Usagi. The role is corny as Hell and thankfully while she premieres in Act 19 her final shot in the series is in Act 20. The series is really coming into it's own with these four episodes and things only get better from here on in. 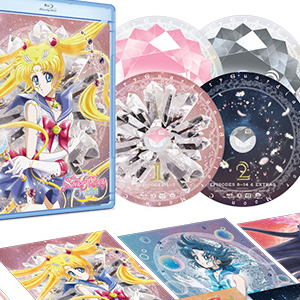 If you're a Sailor Mars and Venus fan like I am, this DVD is a must have but even if these two aren't in your top three there's so much important story developments here that your Pretty Guardian Sailor Moon viewing would be seriously impaired if you gave this disk a miss.